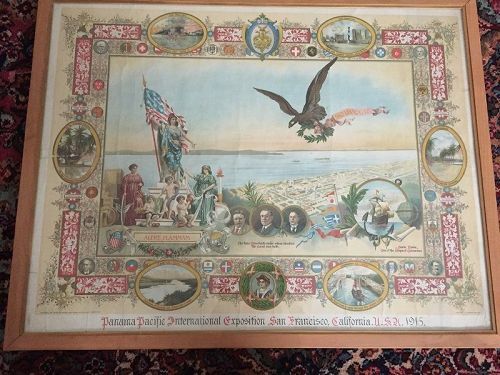 Here is a fabulous, vibrant chromolithograph celebrating the Panama Pacific International Exposition held in San Francisco, CA in 1915. In the lower left corner it reads " Copyright Pietro DeMauro 23 Duane Street New York Room 610" ; the right corner, "Rossotti Lithographing Company". There are some issues notably paper loss in the mid left section and smaller areas including the upper, mid and lower right edges/corners. There is also noticeable rippling and creasing. Please refer to the photos carefully. The frame measures 27-1/2" (h) x 35-1/2"(w). Not examined out of the frame.